Every year we attend a orchard and do as many activities there as possible! It is one of my favorite traditions that we do, and not just in the fall. Ever. The corn maze is a must, plus warm apple donuts and fresh cider. This is also when we buy a bunch of apples for me to bake away! My mom grew up on an orchard and has instilled in me that apples from the orchard are the BEST apples. Hands down. Last year it was really fun because they had a little target practice area where you tried to hit targets with apples flying out of air cannons. AND they had pig races. Have you noticed many of our items are food related? We can’t help it! 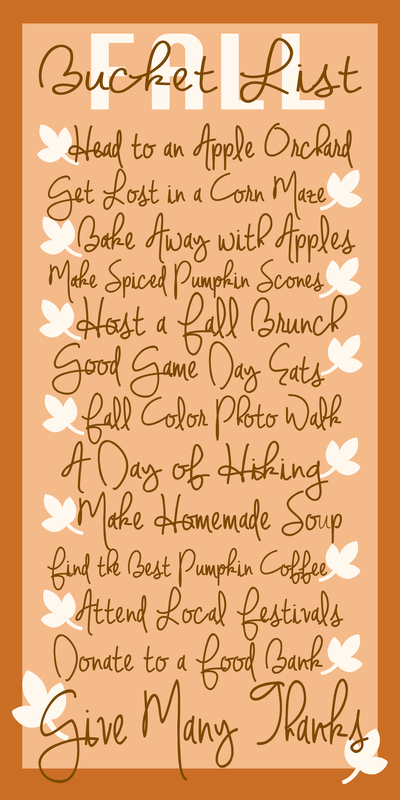 Fall is full of such amazing flavors; pumpkin and apple are two of my faves! We’ve never hosted a fall brunch before, so that’s a new item this year. After making the Pumpkin Cinnamon Roll Casserole last week, I wanted an excuse to make it again! I am hoping to get it in the calendar soon because I know it won’t happen if it’s not scheduled.